Urban Design Since 1945: A Global Perspective reviews the emergence of urban design as a global phenomenon. The book opens with the urgent need to rebuild cities and re-house the millions of refugees living in camps and shantytowns at the end of the Second World War. Against this background, the book traces the collapse of the modernist, comprehensive state-planning schemes on both sides of the Iron Curtain as global corporations emerged, concentrating on networks and enclaves. It describes how Latin America and then Asia began a rapid urbanisation process, shifting the global urban centre away from Europe and overturning existing urban design models. This resulted in global megacities of an unprecedented scale, often with large associated shantytowns. By outlining the dominant models in urban design over the last sixty years - the metropolis, the megalopolis, the fragmented metropolis and the global megacity - the book provides an essential framework for students of the subject. • World's Fairs such as Brussels 1958 and Osaka 1970 which feature as drivers of innovation, as do Olympic events in Tokyo (1964), Barcelona (1992), Beijing (2008) and London (2012). 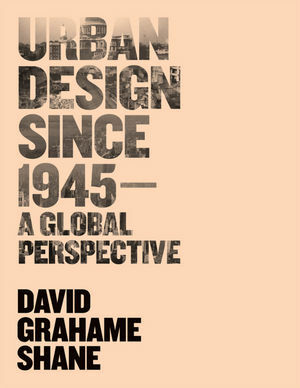 David Grahame Shane teaches Graduate Urban Design at Columbia University and undergraduate students at Cooper Union in New York. He also lectures for the Bartlett School of Architecture Graduate Urban Design Programme, University of London and at the Polytechnic in Milan, as well as participating in masterclasses at the University of Venice. He has lectured widely and published in architectural journals in Europe, the USA and Asia. He co-edited with Brian McGrath the Architectural Design title Sensing the 21st Century City: Close-Up and Remote, published in November 2005. His book Recombinant Urbanism: Conceptual Modeling in Architecture, Urban Design and City Theory was published by Wiley in June 2005.